Outside of the expense, the second most common thing I hear is "I don't have time." It takes time to meal plan; it takes time to exercise. I get it. There are only so many hours in the day, in the week. It's easy to put everyone else first. It's hard to justify the time it takes to create and maintain healthy habits. Truly, I get it. People are busier now, more than ever. Careers, children, hobbies, households... everything and everyone wants a piece of you, right? Who has time to take care of themselves? Guess what? That's a rhetorical question, believe it or not! Let me tell you a little story, k? I LOVE to fly. I love being up in the clouds strapped into a hollow metal tube. It's exciting and amazing that this metal tube can be suspended in mid-air. Wouldn't you agree that science truly outdid itself with air travel? But what happens at the beginning of EVERY single flight? The flight attendants go over safety instructions. And what is part of every set of instructions? The statement that you should put your own mask on before helping someone else, even if that someone else is entirely dependent on you. Did you ever wonder why that was? The truth is, without oxygen, you are of NO USE to ANYONE else! You CANNOT help anyone unless you help yourself first! Did you ever stop to think about that in terms of the rest of your life? How often are you confronted by circumstances outside of your control? How often do you "lose cabin pressure" in your crazy, busy life? 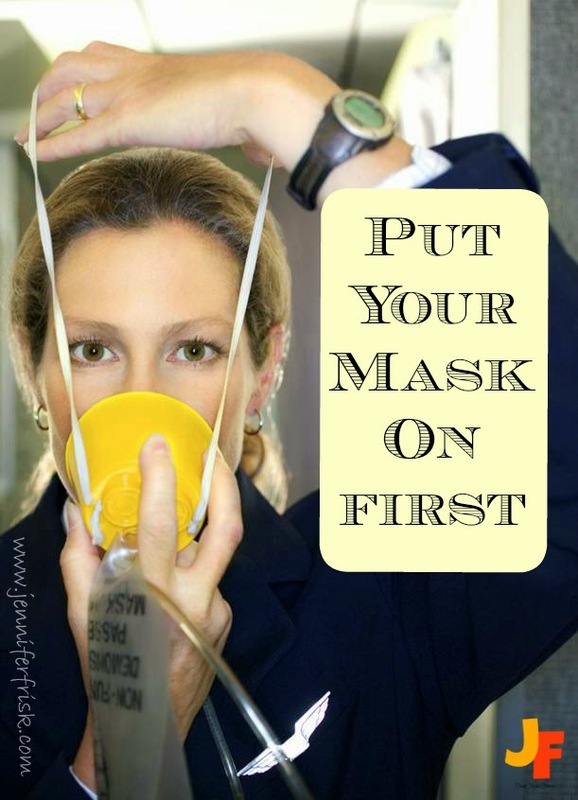 Do you take the time to apply your own oxygen mask first? Tired of the airplane analogy? Ok, how about a true-to-life example? I've told you before about my bout with depression. I was running ragged, trying to make everyone happy, and trying to justify the expense of going back to school as well as working in the "big city." I was failing. And I was NOT taking care of myself. So what happened? I crashed. And burned. And burned some more until I finally found a small way to take care of myself. And then I was able to function - minimally - but function all the same. And then I discovered the best antidepressant there is: endorphins. And the best preventative medicine? Exercise. So, you see, not having time is not an option for me. Can I hear you saying, "But, Jenn, I have 4 kids and a dog and a husband and a job and, and, and, and...."? Ok, so I've explained the importance of taking care of yourself, but I do acknowledge that there are only so many minutes and hours in a day. So how do you manage it all? Meal plan - Take at the most, a couple hours during your weekend to plan your meals for the week. Chop any vegetables that need it. Portion out meats and snacks. Believe it or not, spending a little extra time at the outset will SAVE you time during the week. It is so totally worth it! Work fitness into your day - Just 10 minutes three times a day is the equivalent of 30 minutes of continuous exercise a day. Research shows that there is no difference! Can you find 3 chunks of 10 minutes? Anywhere? Consider "condensed" programs - Beachbody now has several programs 30 minutes or less per day. These programs, though short in length, bring crazy results! 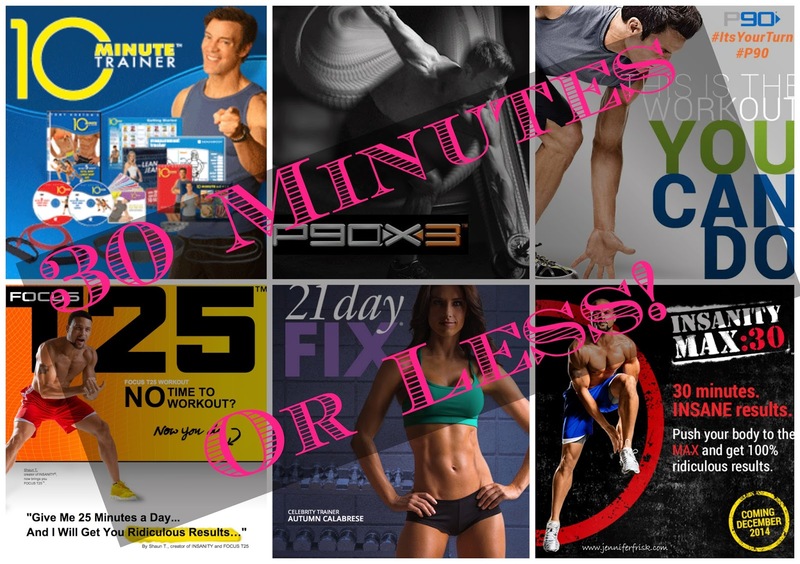 10 Minute Trainer, Focus T25, P90X3, P90, 21 Day Fix, and Insanity Max 30 (coming in December) are all 30 minutes or less. Can you find just 30 minutes in your day? Just 30 minutes to carve a phenomenal physique AND mental health? I would wager *anyone* could find 30 minutes. So what say you? Will you join me in smashing this excuse? Will you commit to 30 minutes a day to keep your own "oxygen mask" on? I'd love to chat with you, so please use the link to contact me! Remember, #NoExcusesNovember! Tag your posts and pics! I wanna see em!